We all know it’s important to spend one-on-one time with each member of our family. It makes sense, intuitively, that we need this time to build strong relationships. We schedule date nights with our partner (or aspire to!). And there’s something that feels different about the bond that forms when we spend time one-on-one with someone, even from an early age. In working motherhood, though, there’s this little thing called time that gets in the way of our best intentions. Our days are often a frenzy of work and home commitments. It’s hard to get everyone where they need to be each morning. Let alone carve out one-on-one time with each child. In my family of four, we have a tendency to travel as a pack. A herd of redheaded Levins, commuting around the District of Columbia, if you will. It’s gotten to the point where when one of the four of us is not in the car, our youngest will declare, “but the whole family is NOT here! !” We’ve got the being-together-as-a-family thing down. Which I love, and wouldn’t trade for anything. Finding time I can spend alone with each child, though, has been a bigger challenge. Here are some thoughts on things I’ve tried and that have helped. When you’re together for one-on-one time, point it out. I read this recommendation somewhere, and it’s been a fantastic piece of advice. When you’re actually sitting there with just one of your kids at the table, note (out loud!) that it’s so nice that only you and [child’s name] get to eat breakfast together. Just the two of you. Then, you’ll start to notice for yourself that there are indeed times when you’re one-on-one that you hadn’t thought of. And it makes an impression on your child that you’re noticing it. Plan a One-on-One Day with Each Child. With my two kids, C and S, we’ve dubbed these “Mommy-C Day!” and “Mommy-S Day!”, and they remember the days with fondness, months after the days have passed. With my oldest, I took him to the National Arboretum, and he still talks about the baby tomatoes we picked. Then we went to see his first-ever movie in a movie theater. With my little guy, we went swimming together at the local pool, rode the metro, then spent the afternoon riding escalators at a local mall and hanging out at World Market. We bought a little red bird towel-hanger at World Market that’s now in our bathroom, and S often declares, “That’s the bird from “Mommy-S Day!” I love that we have a visual reminder of that special time together. Trade Off Recurring Events. Does one of your children go to a weekly activity, perhaps on the weekends? Trading off who takes that child to the activity creates an automatic one-on-one time opportunity. 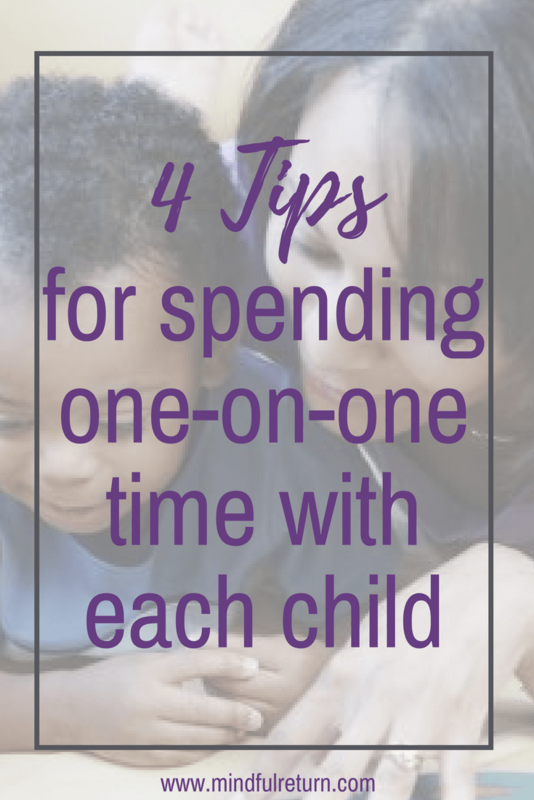 If you have more than one child, it also means one-on-one time for the other parent with the other child who’s not heading to that activity. Think About Bedtime. Though they are wonderful times for bonding, bedtimes can be such a struggle. Especially in the early years. I had my boys 26 months apart, and when the baby arrived, I started doing bedtime (nursing, etc.) with him. After I was done nursing, I switched to being the parent who put our oldest to bed, and my husband took over bedtime duties with our youngest. And we continued on that way for a long time. Now, a few years later, the youngest has a voice, an opinion, and a desire for mommy to put him to bed. (“Daddy is getting tired from all that putting me to bed!” he declared recently.) So, we’re giving a new system a try, where we split up bedtimes. Certain nights of the week, I put our oldest to bed, and the other nights of the week, I put our youngest to sleep. It’s a work in progress, but so far so good. Finally, and perhaps most importantly, let yourself off the hook, mama. The fact that this issue worries you means that you ARE being thoughtful about your relationship with each child. You will figure it out over time. Things change as phases change, and there’s always an opportunity to course-correct. I’m pretty sure, like most things in parenthood, the question of one-on-one time with each child will be an ongoing, ever-evolving dance. What has helped you be able to spend one-on-one time with your little ones? Leave your thoughts and ideas below in comments! Heading back to work after maternity leave? 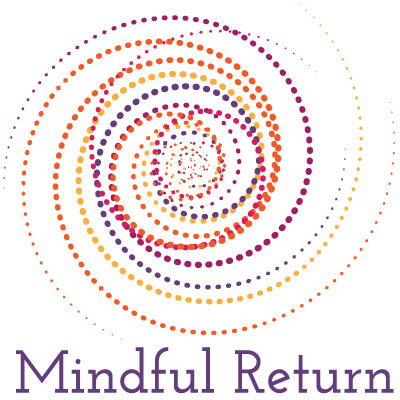 Get help with the transition by joining the next session of Mindful Return. Love this! Also, something that helped me when our younger was small was taking him on my work trips with me. I had a babysitter during the day, but we had all this solo time during travel, in the mornings and at night without all the distractions and obligations of home. Ooh – that’s a great one, Arielle! Thanks for sharing. This is such a great issue with 2! It’s all extra important to me because I’m going through a divorce (we share kids 50 / 50). I highly recommend taking advantage of the always hard pick up / drop off routine for extra one on one time. My kids are 2 and 4 1/2. So far they’ve been in separate schools this whole time, which is kind of crazy on one hand, and yet has been the right choice for education and financial reasons. One added benefit is it means that each parent commutes with each child one way each day. I drop off our son and pickup my daughter and my ex does the reverse. Eventually they’ll be in the same school and that’s one thing I’ll really miss. I’m also struggling with my two year old being at the point where she’s ready to go to bed at the same time as her brother. Before she went to bed earlier and I’d always have time with my son before bedtime. But as you say Lori being cognizant of doing one on one time and also pointing out all the little periods of one on one time goes a long way and is great advice! I also like doing special days with each kid when I can. Thanks for weighing in Ashley and for the great advice. They may still have different bedtimes for a while, too – at least mine do, and they’re 3 1/2 and 6. The 6 year old no longer has naps at school, so he crashes (hard!) at 8pm, while the 3 1/2 year old still naps for 2 hours at daycare (but doesn’t need to) so is up much later. It’s always a work in progress, and glad you are finding ways to spend some quality time with each kiddo.